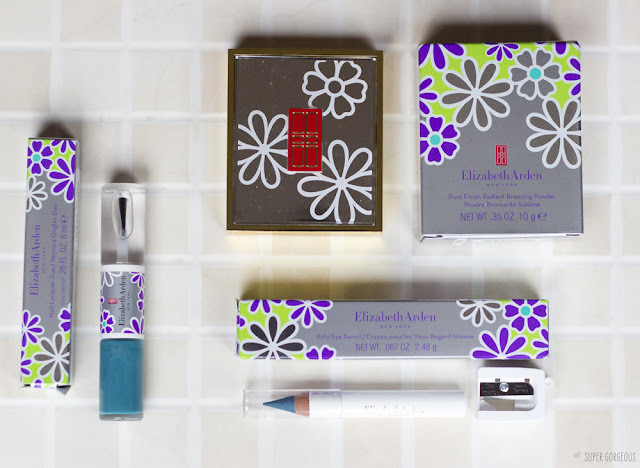 When I saw the packaging of the new Elizabeth Arden, New York in Bloom Collection, I did an inside squeal - it's sooo pretty! 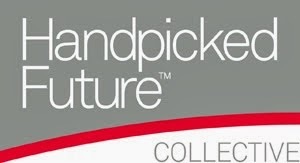 Covered with floral motivs - it seems a step in the funky direction for a brand I normally consider to be quite classic. The collection is made up of two bronzing powders - soft and warm, two nail duos - a teal and purple shade with a top coat at one end, three eye pencils - teal, platinum and brown, and two eyeshadow trios - one based on the teal palette, another on golden tones. It's a really pretty range - both packaging and product wise. I have the Pure Finish bronzing powder in Warm. There are flowers embossed onto the powder in bronzey and pink shades - but it looks very frosted and on seeing the product in the palette, I was a little worried at how frosty it would be on the skin. 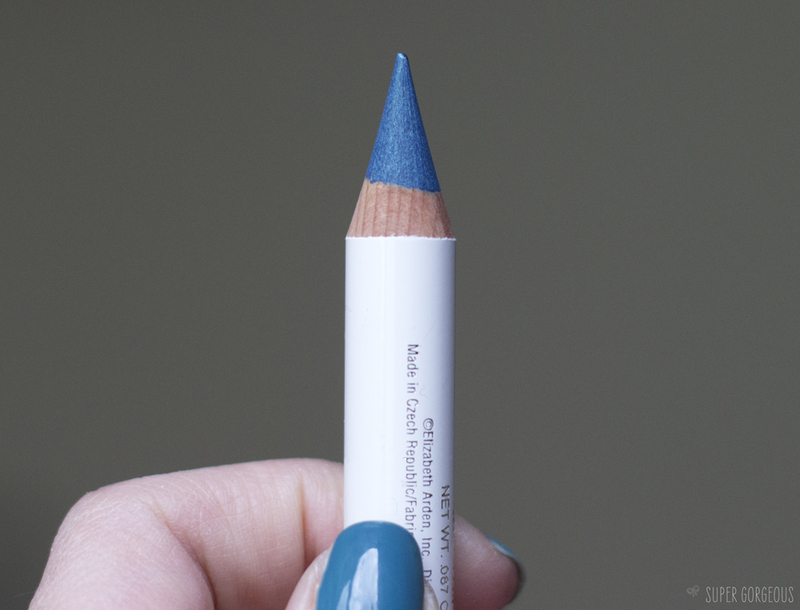 The Eye Pencil comes with a sharpener in the box, which I think is a nice touch. The colour of Iridescent Teal is very bold and pigmented - and is exactly that - iridescent teal with beautiful golden tones running through the teal. 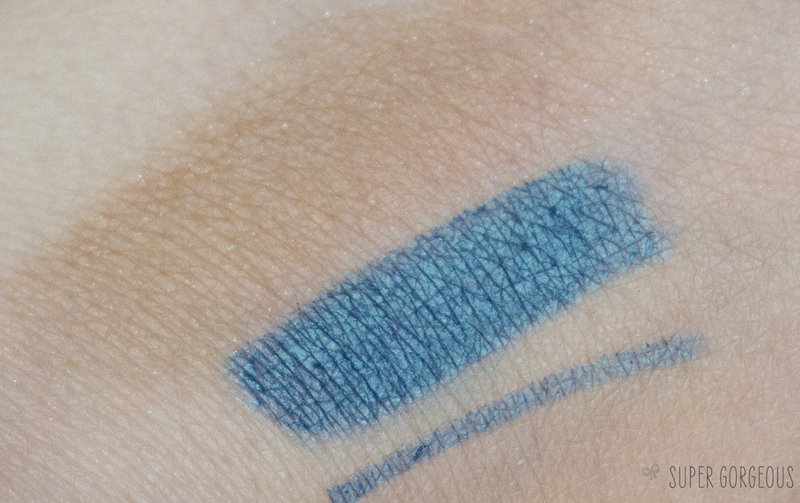 As you can see from the swatch photo above, the bronzer isn't frosty at all, although it does have a slight shimmer to it - it gives a radiance to the skin rather than a glitterbomb effect. 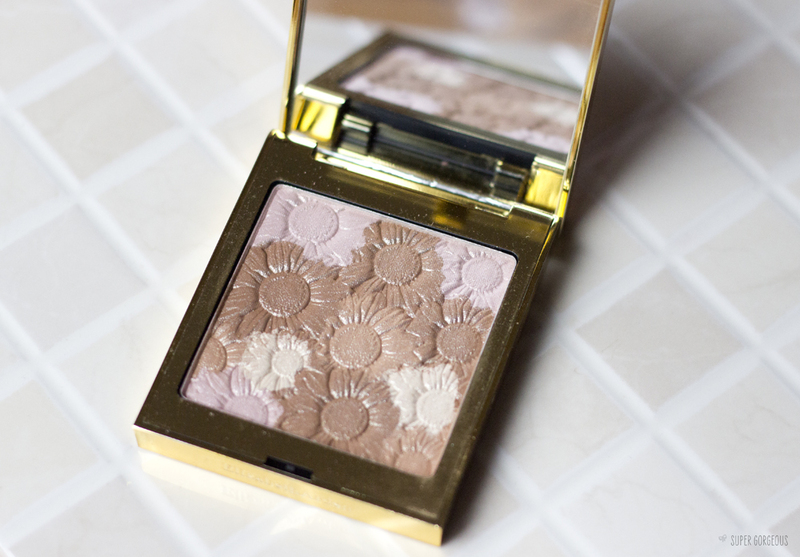 It has a flattering yellow-bronze colour to it which is the kind of colour I like in a bronzer. The Elizabeth Arden website gives the tip of wearing the eye pencil under the lower lash line - so that's how I decided to wear it. 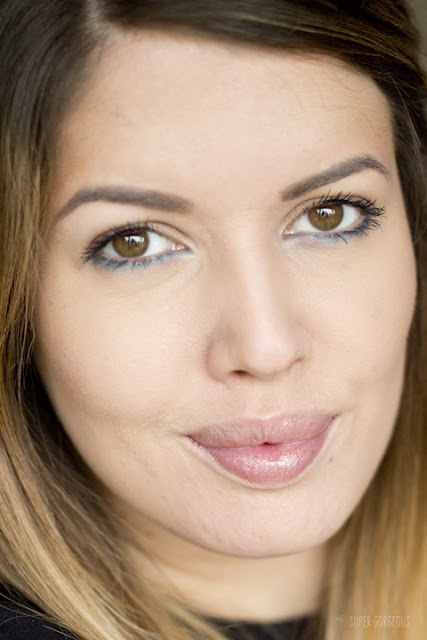 It was very easy to apply but you do need to wear a primer under it and powder over it as I found it can transfer down your eye a little without. 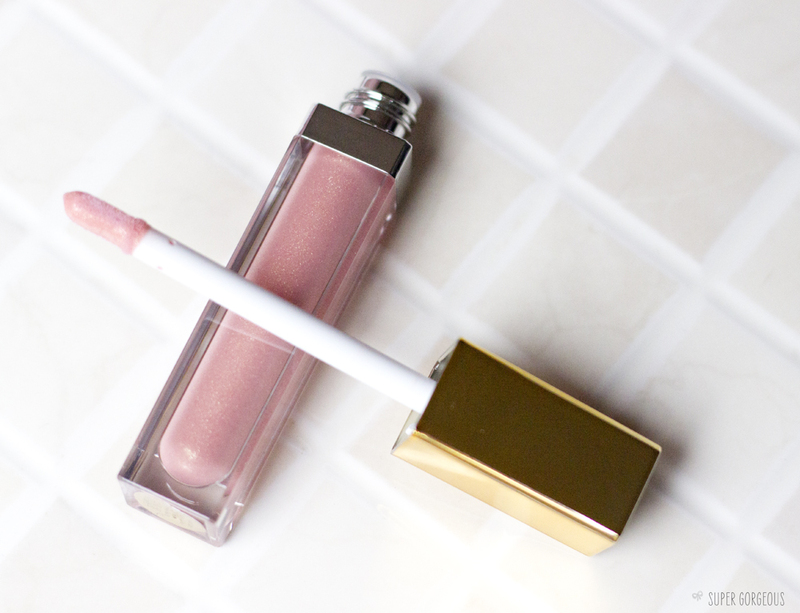 I am wearing both the products in the photos above, teamed with Elizabeth Arden's Beautiful Colour Luminous Lip Gloss in Precious Petal. It's a yummy, toffee flavoured gloss that glides on and feels really moisturising - it contains mango butter and shea butter. 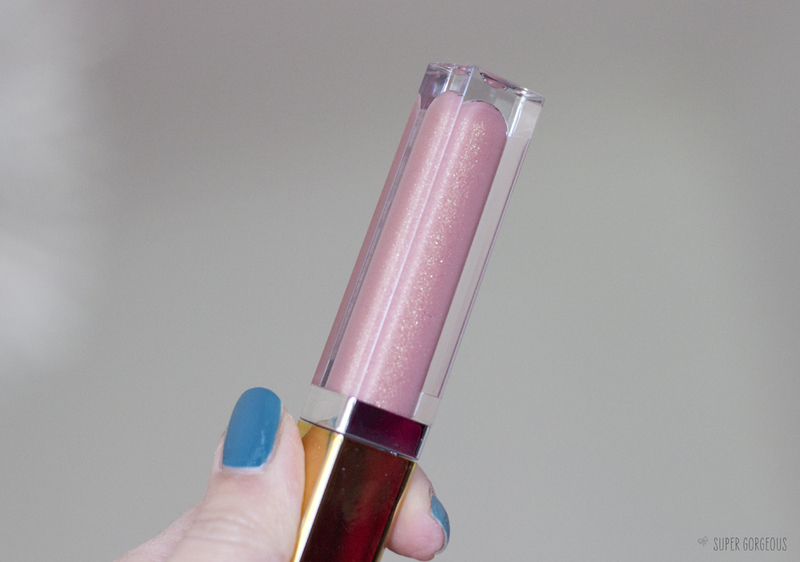 When the gloss eventually fades, you are left with a pretty shimmer on the lips. It's another well designed product - with a mirror on the side of the bottle so you can touch-up on the go with ease - the applicator is flattened which makes it so easy to apply too. 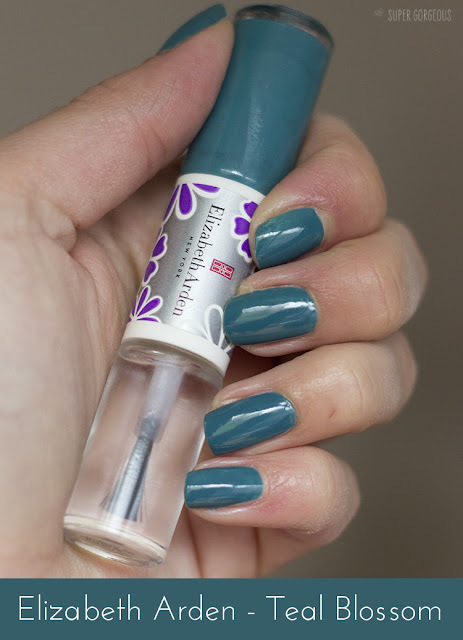 The last product I have from the New York in Bloom Colour Collection is the nail laquer in Teal Blossom. While I had it on I had lots of compliments on the colour. It's a true, greeny-blue-petrol teal shade which, when used with the top coat, leaves a nice glossy finish to the nails. This is my first foray into Elizabeth Arden's make up range - I always considered it to be for women a bit older than me, but I am definitely, 100% proved wrong! Let me know if you've tried anything and have any recommendations.